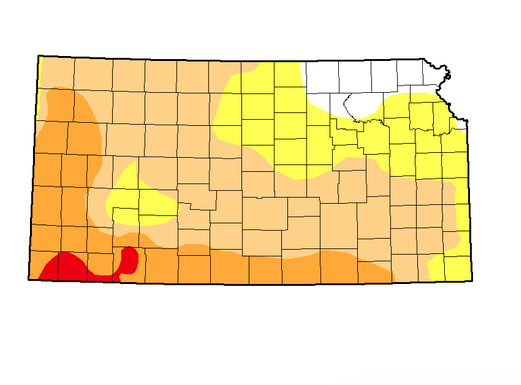 A new report issued by the National Drought Mitigation Center says 69 percent of Kansas is under a moderate drought, and 22 percent is under a severe drought. The thunderstorm that took out trees and left thousands without power in Wichita last week brought a lot of wind and hail, but not a lot of rain, which won’t help the persistent droughts active throughout Kansas. The National Drought Mitigation Center says much of the western and mid-western parts of the country are dry--ranging from the harshest of conditions in parts of California to more moderate droughts in the Great Plains. According to the report, since last November, the percentage of winter wheat crop rated good to excellent in Kansas fell from 61 percent to just 39 percent. 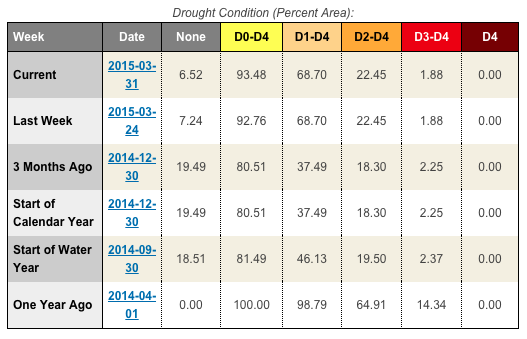 Corn production has also taken a hit due to the drought. Long term forecasts are still favorable, however, with spring weather predicted to bring the Midwest more thunderstorms and more rain. Winds reached nearly 90 mph overnight and early Friday morning damaging trees and buildings. KMUW’s Abigail Wilson reports that many homes and businesses are still without power in Sedgwick County.